Toronto, ON May 30, 2018 – The Catholic Civil Rights League (CCRL) is pleased to announce that its annual Spring Dinner will take place in Toronto on June 18 at 6:30 pm at the Sala Caboto Ballroom at 40 Playfair Ave, west of Dufferin, south of Lawrence. Tickets are $125 each for individuals. We are offering a special rate of $1000 for a table of 10. We encourage organizations, or even groups of friends to save money and help the CCRL by organizing a table. With either option an RSVP is required by calling (416) 466-8244 or 1-844-722-CCRL or by emailing ccrl@ccrl.ca. The evening will include a talk by Tanya Granic Allen. 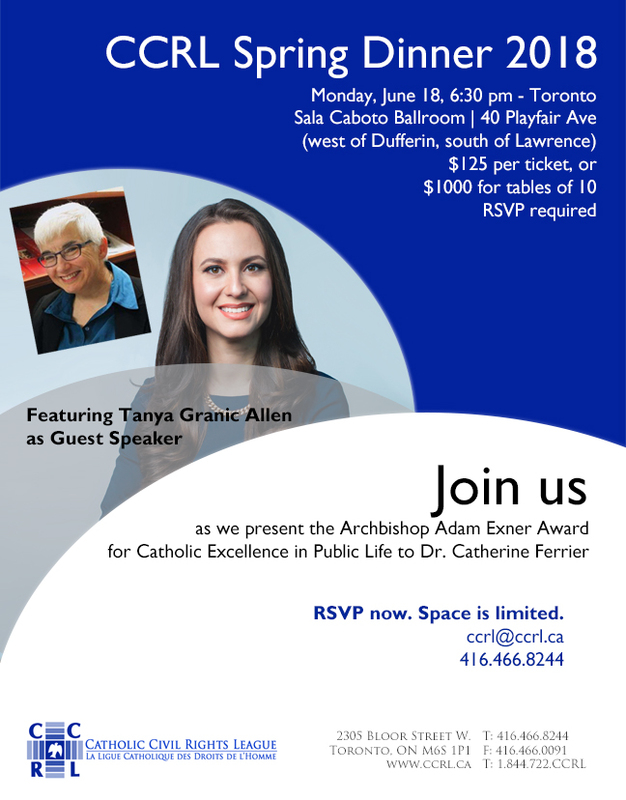 The 2018 Archbishop Adam Exner Award for Catholic Excellence in Public Life will be presented to Dr. Catherine Ferrier.